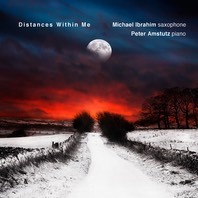 West Virginia-based saxophonist/piano duo, Michael Ibrahim and Peter Amstutz, explore a program of three pillars of American concert saxophone music -- Sonatas by William Albright and Paul Creston, and the single-movement work, Distances Within Me, by John Anthony Lennon. Each composition shares a sonorous approach to harmony and expansive melodic material. Gestures are revealed through a blend of virtuosity and introspection.